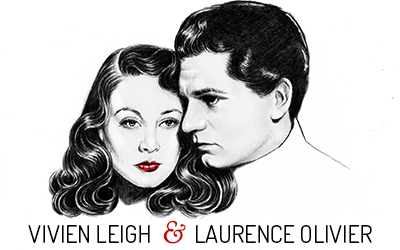 I was making Wuthering Heights with Larry for Sam Goldwyn in 1939. Viv came out to be with him and from then on I became a close chum. I was with them when she got Scarlett…she was a Dresden beauty and quite sure she would get it!! Her immediate taking of sides for under-dogs. Her generosity (to a hair-raising extent). Her genuine concern fro her friends’ welfare and for everybody’s feelings. Her unbitchiness about other beautiful girls. We had a million gorgeous arguments but never a quarrel–sides were clearly taken by her–no half measures. Her acting? Always hard to judge very close friends in one’s own profession…but she never failed me, often surprised me, and was sometimes unforgettable (in Wilder and Shaw and as Scarlett particularly). As a beauty she was at the top of the tree. She never went through an un-beautiful phase. A story about her: she was godmother to my eldest son. She gave him a christening mug with his initials on it (D.W.G.N. correctly) but it was delivered with D.W.G.W. inscribed–When I pointed out this mistake she said “Oh, well it’s perfectly simple we’ll just change your name to WIVEN”…and to the end I was Wiven or Wiv to her. And another: in 1939 Larry and Viv and I were on a yacht off Catalina when Chamberlain announced that war was declared. We all made patriotic noises about leaving at once for home–it was one of the few times I’d seen her cry. I’ll never forget her arrangements. Nor her love of Alex Korda. Nor all those cats. Her ridiculous laughter, her fabulous generosity of heart and her guts in adversity. 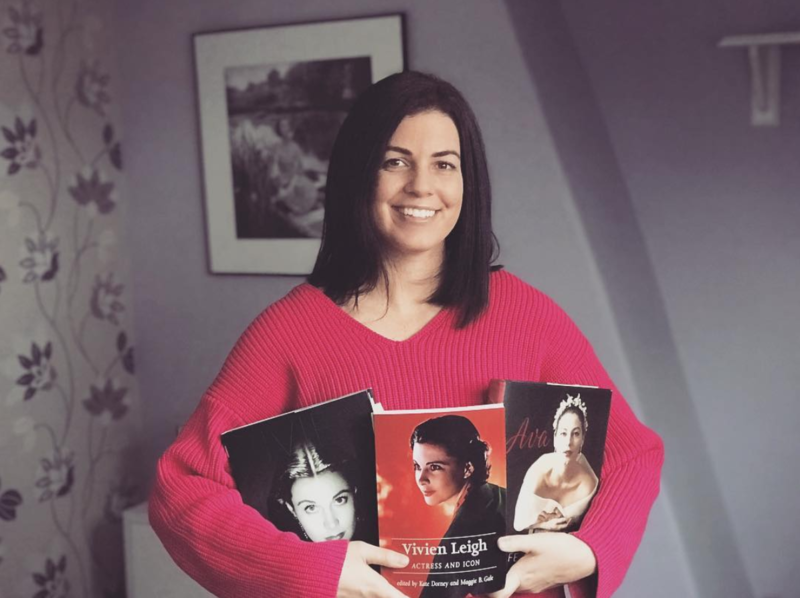 In the biography Vivien Leigh by Hugo Vickers, the author mentions an account David Niven wrote about Vivien’s complete nervous breakdown in Hollywood, 1953. 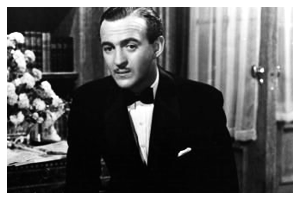 Niven disguises Vivien’s name as “Missie” so as not to reveal her identity (most likely out of respect for their friendship while Vivien was alive). Here is his account of that troubling and sad time, as found in his second book, Bring On the Empty Horses. At six o’ clock in the morning Mae called me on the telephone. I tried to reassure her, but nothing would persuade her to come back into the house with me, so I took her key and watched her head quickly down to the treelined street in the direction of Sunset Boulevard-she never looked back. It was still dark, and no lights showed in the small house as I quietly let myself in the back door. I didn’t know what to expect, so I stood inside the kitchen and called out softly a few times, “Missie, it’s David!” There was no answer, then the sound of footsteps above. I pushed the swing door into the hall. Suddenly all the lights went on, and there stood Missie at the top of the stairs. Her hair was hanging down in straggly clumps; the mascara and make up made a ghastly streaked mask down to her chin; one false eyelash was missing; her eyes were staring and wild. She was naked and looked quite, quite mad. When I tried to reason with her, she sat on the landing, alternately sobbing like a child and snarling down at me through the bannisters like a caged animal. I knew i must get her a doctor, buthe very mention of the word brought on the most terrifying reaction. I knew also that she must be overdue at the studio make up department, and any minute the asistant director would be calling up to find out if she had overslept; above all, I knew that if Missie had cracked up, no word of it must leak out to the press or she’d be finished in Hollywood. In desperation I tried an offhand approach. At that hour of the morning in the early days of TV, there were no programs on the air, but I had a feeling that I must coax her downstairs and try to keep her busy. I switched on the set, which cracked and hummed and displayed nothing but horizontal lines, and settled myself on the sofa to watch them. After a few minutes the stairs behind me creaked, but I did not look around. I could sense that Missie was standing watching me. The she came shyly into the room, like a child, and curled up on the sofa next to me to watch the blank screen with a funny private smile. We sat there togehter for a long while. Occasionaly she would let out a peal of laughter and point at the set; sometimes she would shrink back in horror; once she screamed with fear and moved up close beside me. Goosebumps rose on my back. I put my arm around her naked body to protect her from whatever it was she saw in her poor faraway mind-she was icy cold. The phone rang in the kitchen. I glanced at my watch. It was only eight o’ clock, but I already felt that I had been in that house for a lifetime. It was indeed Mac, the assistant director. He was in a highly choleric condition. By a great stroke of good luck I had worked with Mac and knew him for one of that priceless breed of true professionals who can guide unsure directors, make life pleasant for actors, and save money for producers. Once he had identified himself, I whispered down the phone. I fetched Missie’s husband’s overcoat from the hall closet and joined her once more before the television set. She snuggled under the coat and clasped my hand. “Isn’t she lovely?” she said, pointing at the empty screen. Around nine o’ clock I heard the front doorbell ring. Missie was transfomed. “Don’t let them in!” she pleaded. “They’ll take me away!” I promised that I wouldn’t let anyone in if she would be a good little girl and go up to her room and shut he door. I watched her still gorgeous back view ascend the stairs. On the doorstep I found a highly strung, fat, yougnish man dressed in white slacks and open neck shirt. His black hair was slicked down, and his eyes were obscured by dark glasses. I brought Missies’ prodcuer up to date and told him that in my opionion she would be unable to report for work for some time. When he had gone, I found Missie crying among the shoes at the bottom of her wardrobe. After another hour of empty television I claimed an urge for a cup of coffee and left Missie reacting to the horizontal flashes while I headed for the kitchen and another whispered phone call, this time to the new head of her studio-a quiet, dignified man I had met only once. He was light years ahead of his image consicious producer. I underlined the urgent need for a doctor, and he instantly agreed to alert my old friend from Santa Monica, whose office, far from Beverly Hills was unlikely to be infiltrated by gossip columinsts’ spies, eager for the hot news of an impending abortion, a drying out, or a breakdown. He also promised to locate Missie’s husband and get him an immiedate message, telling him, from me, in the most urgent but least frightening terms, what had happend to his wife and to urge him to return posthaste. We both agreed it would take him at least three days to make the trip. Probably from her horus of naked exposue in a drafty hosue, Missie was coughing intermittently, so I told her that my doctor would be passing by to give me “an injenction” and that I’d ask him to check her over at the same time and pehraps recommend something for her cold. To my surprise she agreed without much ado, but when I suggested that she clean up her face for the impending visit, it provoked another screaming spat of abuse: If I didn’t think she was beautiful the way she was, why didn’t I get the hell out?…Who invited me anyway? Et cetera. After she calmed down, we returend to the television set, and Missie ate some cottage cheese. She suddenly turned on the poor man and started belaboring him and pushing him toward th front door. She yelled and screamed and poured out torrents of abuse on him and on all her girlfriends, naming them one by one, reviling them and accusing them of plotting against her. It hadn’t taken long; probably a secretary in the fat producer’s office had heard him pressing the panic button. Louella’s well known drawl came over the phone. She demanded to speak to Missie. “Who was that?” asked Missie when I went back to the television room. “Oh, just Louella,” I said off-handedly. Missie was instantly transformed. “Why don’t you want me to speak to Louella?” she yelled. “She probably wants to do a Sunday story on me…You know I love Louella.” She ran into the kitchen and started looking up the columnist’s number. I grabbed the phone from Missie’s hands, and a battle royal took place for it’s possession. She went for my eyes and testicles with fingers like hooked claws, so during th sobbing period that followed the encounter I took the doctor’s advice and locked up all the sharp kitchen implements I could find. The dreadful day dragged on. During the afternoon I finally persuaded her to take two of the doctor’s pills, which she had hitherto regarded with the deepest suspicion, but first she wanted to take a walk around the small swimming pool. Stark naked as usual, she paraded around the garden, and I prayed that prying journalist eyes could not see through the hedge. When the moment to take the pills came, she grabbed the bottle out of my hand and ran off like a naughty child, hid it behind her back, and demanded a kiss in exchange for it. This payment having been extracted, she deliberately emptied the contents of the bottle into the deep end of the pool. The doctor paid his second visit, and Missie refused to let him inside the house, saying he was one of “them.” I managed to have a few words with him in the garden. “Only cottage cheese, ” I told him. My heart sank-it was only Thursday evening. Missie made the offer the doctor had predicted during our first night together. “I’ve something for you,” she said seductively, and ran upstairs, giggling. Half an hour later she called down. Her face was cleaned at last, her make up redone, her hair brushed and falling into a golden cloud over her shoulders, and she was wearing a short black see-through nightie. She looked lovely. “Come and get it,” she whispered from the top of the stairs, turning her back in a parody of sexiness and lifting the hem of the nightie. It was not an easy evening for me, to put it mildly , and it ended in a galls and bottle throwing scene with Missie ordering me out of the house, an instruction I longed to, but dared not, obey. The pills did not seem to have much effect on Missie. Around midnight she ate some cottage cheese which contained a couple and drank some wine into which I had stirred a third, but they slowed her down for only an hour or two; then she was as bright and demanding and as terrifyingly unpredictable as before. I dared not go to sleep for five minutes, and as the long days and interminable nights melded into each other, a dreadful thought began to me-that it was not Missie whose mind had become deranged…it was mine. I became a hollow eyed zombie, sleepless and utterly exhausted, but Missie never showed any signs of tiredness and harried me endlessly to play hide and seek with her, to flatter, her to comfort her, to fight with her, or to go to bed with her. I found I had come to hate her. Twice a day the doctor met me in the garden to give me news of the husband’s progress and to inject me with floods of BQE to keep me going. By Saturday evening I could go no further. He outlined the plan. I was to leave the front door open and at 9 o’ clock exactly he would slip in with a trained nurse, who, he said, would act as a witness, help with the injection, and also stay the night to take care of Missie when she came around. The two of them would hide in the downstairs bathroom; then, on some pretext, I would coax her into the hall, grab her, throw her on the ground, and hold her down while the deed was done. Missie seemed to sense that something was going to happen. For the fist time her eyes lost their wild look; she seemed calm, almost normal and very vulnerable. She followed me wherever I went. Also, for the first time, she talked about her husband. She had not mentioned him once during the whole time I had been with her. “I hope he comes to see me,” she said sadly. It was eerie. A few minutes before nine I told her I was hungry and asked her to come help me fix a sandwich. She left her favorite place in front of the television set and put her hand trustingly and childlike in mine. As we passed through the hall into the kitchen, I caught a glimpse through the curtains of the doctor’s darkened car at the gate. We puttered about in the kitchen, and I received another reminder of the premonition that had awakened within my charge. For a moment I thought she too might have seen the car. “Of course not” I said, loathing every second of the dreadful charade that was unfolding. Slowly I ate my sandwhich. When I judged that sufficient time had elapsed from my conspirators to be in position and ready, I took Missie’s trusting hand in mine and led her into the hall; a chink of light showed from beneath the bathroom door. Clumsily I swung the poor naked girl around, hooked one leg behind her knees, and flung her to the ground. After a first startled gasp she fought with incredible ferocity and strength. She didn’t scream, she was spitting like a panther, biting, clawing and kicking. I finally manged to eagle spread her on the floor and pin her arms by kneeling on the elbow joints. I yelled for the doctor. When she saw two strange forms approaching, one in white uniform and the other bearing a hypodermic syringe, Missie screamed at last, long piercing notes of pure animal terror. The nurse held Missie’s feet, and between us we controlled her convulsive struggles while the doctor did his work. It was soon over, and as she began to calm down I avoided her eyes, filled as they were with such blazing hatred at my base betrayal. Later, when we carried her to bed, her face was as innocent and as peaceful as a baby’s. The nurse cleaned up my many bites and scratches, and the doctor gave me something that would enable me to go to sleep at last. None of us spoke. At six the next day, refreshed, but with a leaden conscience and a three day growth of beard, I drove on my way to the airport, through the peaceful emptiness of the early morning streets. A few kids were already abroad, experimenting with brightly colored bikes, and some early risers in curlers and bedroom slippers were retrieving carelessly delivered Sunday papers from beneath bushes in their front gardens. I felt as though I had returned from far, far away.